The kind of CHANGE needed to end brain cancer will take an army of people willing to extend themselves in their own spheres of influence to speak out and impact others with the messages of this initiative. The real impact is awareness. If more of the general public became aware of the importance of getting advanced treatment immediately with a brain cancer diagnosis, this could itself result in higher rates of survivorship and extension of lives. It would also result in more patients getting into critical clinical trials, one of the major goals of the EndBrainCancer Initiative. So you can TAKE ACTION by activating your network and speaking out. Below we have listed several ways you can do that. Before you can speak out effectively, you need to learn what the issues are. This web site is a great resource for you to do just that. Explore the Patient Resource Center. Watch the EBC Initiative slide show. Become informed, stoke your passion, and prepare to care to make a difference! 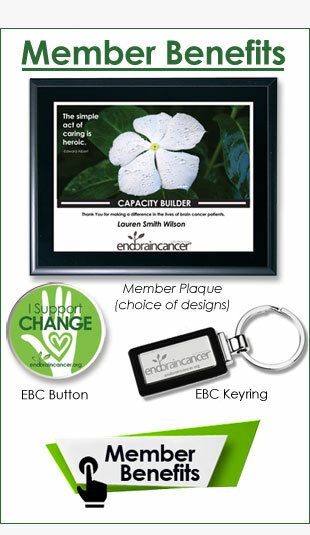 The EndBrainCancer Initiative maintains an active presence on Facebook, Twitter, Googleplus and others. Like us, Friend us, join our feeds, etc. Begin following and staying abreast with all that’s new at EBC! And then tell others. Pass on a post to your Facebook network. Retweet. Encourage people to check out our web site and become a part themselves.